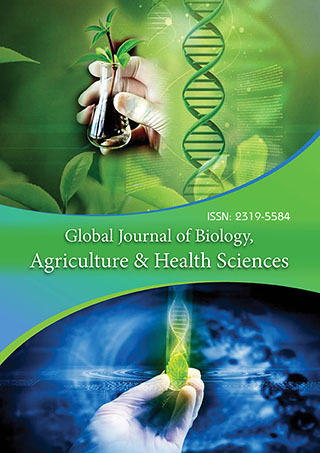 Global Journal of Biology, Agriculture and Health Sciences is a high quality, multidisciplinary, peer-reviewed journal that publishes rigorous research reports from all disciplines within Biology, Agriculture and Health Sciences, including original, interdisciplinary, and qualitative research articles, negative results and replication studies, systematic reviews, and papers describing methods, software, databases, or other tools. With open access and a broad scope, the journal acts as a platform to share and disseminate novel information that will advance our understanding of Biology, Agriculture as well as inform the practice of better human healthcare. Biology, Agriculture and Health Sciences is indexed by Google Scholar. All manuscripts submitted to Global Journal of Biology, Agriculture and Health Sciences should adhere to these editorial policies and to these policies on conflict of interest, human and animal rights, and informed consent. Submission of a manuscript to Global Journal of Biology, Agriculture and Health Sciences implies that all authors have read and agreed to its content and that the manuscript conforms to the journal’s policies. All articles published in Global Journal of Biology, Agriculture and Health Sciences are ‘open access,’ meaning that they are made freely and permanently accessible online immediately upon publication, without subscription charges or registration barriers. Authors of articles published in Global Journal of Biology, Agriculture and Health Sciences are the copyright holders of their articles. However, the ‘open access’ policy implies that authors grant to any third party the right to use, reproduce or disseminate the article, provided that no substantive errors are introduced in the process, proper attribution of authorship and correct citation details are given, and that the bibliographic details are not modified. If the article is reproduced or disseminated in part, it must be clearly indicated. Global Journal of Biology, Agriculture and Health Sciences operates using a peer review system, in which both authors and reviewers are anonymous. Global Journal of Biology, Agriculture and Health Sciences is supported by an expert Editorial Board. Manuscripts submitted to the journal are reviewed by at least two experts selected by the managing editor. Peer reviewers will be asked to recommend whether a manuscript should be accepted, revised or rejected. They should also alert the editors of any issues relating to author misconduct, such as plagiarism and unethical behavior. Reviewers are required to declare any competing interests. More information about the peer review process can be found here. Longdom a self-supporting publisher and does not receive funding from any institution/government. Hence, the operation of the journal is solely financed by the handling fees received from authors. Authors are required to make payment only after manuscript has been accepted for publication. All content information of an accepted paper is strictly confidential and cannot appear in the media (in print or electronic form) before its embargo date and time. Authors/researchers, their respective public relations representatives and funding sponsors may not distribute or promote their work to the media prior to embargo. If an embargo break is the result of any action by an author/researcher, he/she risks withdrawal of publication of his/her manuscript. Violations of the embargo policy may also jeopardize future acceptance of manuscripts to be published in the journal. Generally, embargoes on journal articles lift the day and the time the article is published. Although the Editorial Office will endeavor to notify authors of the anticipated publication date/time, it will not be responsible for any consequences of early online posting with regard to the intellectual property rights. To safeguard their intellectual property, authors should ensure that appropriate reports of invention and patent applications have been filed before the manuscript is accepted. Requests for permission to reproduce figures, tables or portions of articles originally published in Global Journal of Biology, Agriculture & Health Sciences can be obtained via the Editorial Office. Manuscripts submitted to Global Journal of Biology, Agriculture & Health Sciences should not contain material previously published in other publications, except as an abstract, and must not be currently under consideration for publication in another journal. Redundant publication is publication of a paper that overlaps substantially with one already published. When submitting a paper, authors should make a full statement to the editor about all submissions and previous reports that might be regarded as redundant publication of the same or similar work. The authors should alert the editor if the work includes subjects about whom a previous report has been published. Copies of such material should be included with the submitted paper to help the editor decide how to handle the matter. If redundant publication is attempted without such notification, authors should expect editorial action to be taken; at the least, the manuscript will be rejected. Authors and referees are asked to declare any competing interests. Original Contributions submitted by the editor-in-chief and any of the associate editors are handled by a Consulting Editor or by another editor, who makes all decisions about the manuscript (including choice of referees and ultimate acceptance or rejection). The entire process is handled confidentially. All manuscripts submitted from the Editor's home institution are also handled entirely by a Consulting Editor or by another editor from a different institution. The Editor (in Chief) and/or Associate Editors may additionally, from time to time, refer a manuscript to a Consulting Editor to avoid a real or reasonably perceived conflict of interest. Global Journal of Biology, Agriculture & Health Sciences considers research and publication misconduct to be a serious breach of ethics, and will take such actions as necessary to address such misconduct. Authors should refer to the Committee on Publication Ethics (COPE). Statements, opinions and results of studies published in Global Journal of Biology, Agriculture & Health Sciences are those of the authors and do not reflect the policy or position of the journal. Global Journal of Biology, Agriculture & Health Sciences provides no warranty as to the articles' accuracy or reliability.